Some time back I became interested in my Scottish roots and discovered that my maternal ancestors, the Blackwoods, were historically associated with Clan Douglas. 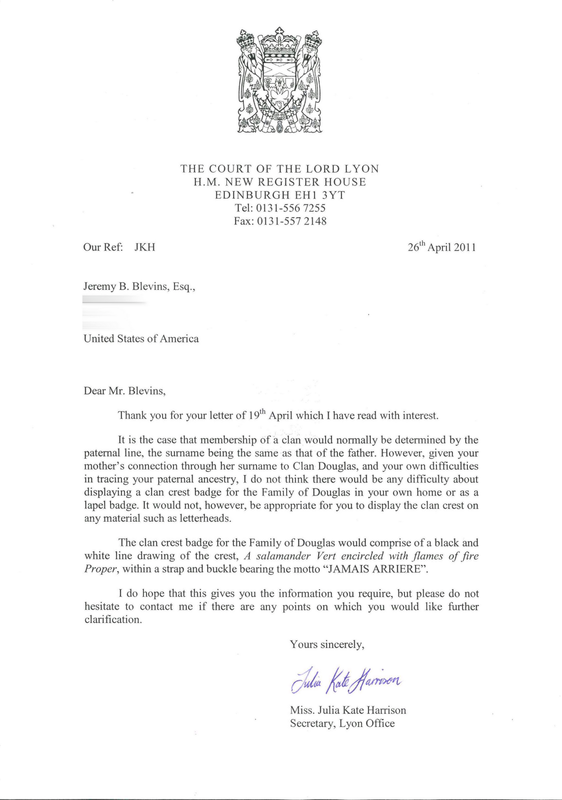 I understand that normally, Scottish clan association is paternal, but given that my paternal ancestry is Welsh, I was curious if I could actually claim clanship through my mother’s line, so I contacted the Court of the Lord Lyon to enquire. Armed with this affirmation, I continue down the rabbit hole that is genealogy. This William Blackwood was the son of Charles Blackwood (b.1680) and Agnes Hunter and was born in Glencarin, Dunfries, Scotland, and christened on 11 August 1706. He married Elizabeth “Betsy” Craige after he had moved to Londonderry, Northern Ireland. They are purported to have immigrated to Philadelphia 1740 aboard a ship named “Mary William”, but I’ve found no ship of such name, though there were ships named Mary, Mary Ann, and William destined from Northern Ireland to Philadelphia about that time.